We’re loving all the fresh eggs our chickens have been laying. Mealtime has never been so easy-just roast some veggies, toss in some greens and throw a fried egg on it! Simple, delicious and farm fresh to boot! We’ve eaten a version of this salad for lunch and dinner multiple times this week. We can’t get enough and I think you all will love how flavorful yet simple this dish is. We’re currently picking arugula from the fields that’s grown back from last fall. We just sowed our spring arugula seeds but they are a few weeks out from being ready. For now I’m just stoked to have some fresh arugula at our fingertips for quick meals. 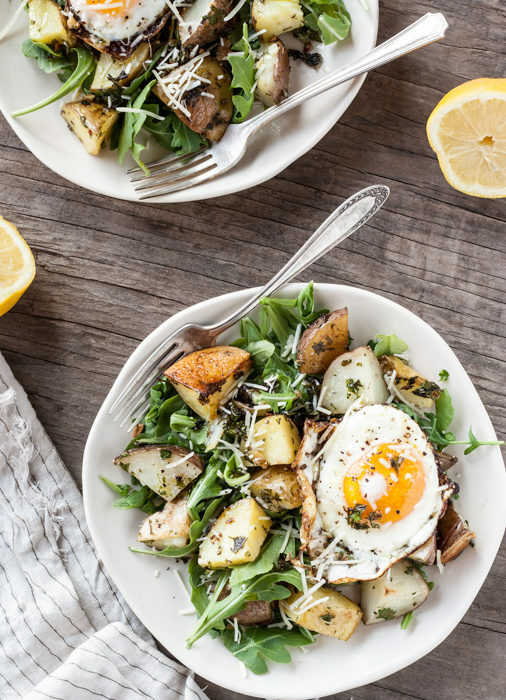 We’ve been tossing the greens on sandwiches, pasta and of course this roasted potato salad. I hope you all enjoy the simplicity of this meal as much as we do. If you don’t eat dairy you can substitute the parmesan cheese with my almond “parmesan” which is really darn delicious too! Crack open a few beers, play your favorite tunes and dig into spring! In a large bowl mix together the garlic, olive oil and fresh herbs. Stir in the potatoes and toss until evenly coated. Spread potatoes in a single layer on a prepared baking sheet. Sprinkle with salt and pepper. Roast until lightly browned and tender, about 35-40 minutes. Stir halfway through cooking. While potatoes cook fry up your eggs. We like to fry ours in a little coconut oil but feel free to use butter or whatever you have on hand. Place a few handfuls of arugula on each plate. Top each plate with roasted potatoes and toss until well combined. Add fried egg and sprinkle with parmesan cheese, crushed red pepper flakes, lemon juice and a little olive oil. Season to taste with additional salt and pepper if need be. Yum! This looks so good. I can’t wait to make it for brunch one weekend. It’s fairly easy too. Most of the work is just cutting up potatoes. That’s pretty simple. This is absolutely gorgeous! I just love your photography! Looks amazing! I’m sure the taste is unbeatable, especially with fresh off the farm products.. I can’t wait for our local farmer’s market to open this weekend so I can give this recipe a try. Thanks for sharing! Just tried this last night and it was EXCELLENT! So glad to have found your blog with some fresh and fun ideas. So happy you loved this too! Thanks for following along on the blog!